I am calling this BREAKING NEWS on two grounds today. First because this is only the third Bashar al-Assad "appearance" since a top level command meeting was struck by a massive explosion in Damascus on July 18th, and secondly because hot on the heels of this Syrian government release, I am releasing, here at the Daily Kos, strong evidence that this footage could have been shot in 2009. If indeed, the Syrian regime has been driven to such desperate measures, I believe it can only be because Bashar al-Assad is either seriously injured or dead. New video images of Bashar al-Assad have emerged that are said to be of a meeting today between the Syrian President and Iran's Saeed Jalili over the problem of the 48 Iranian detainees being held by the Free Syrian Army. 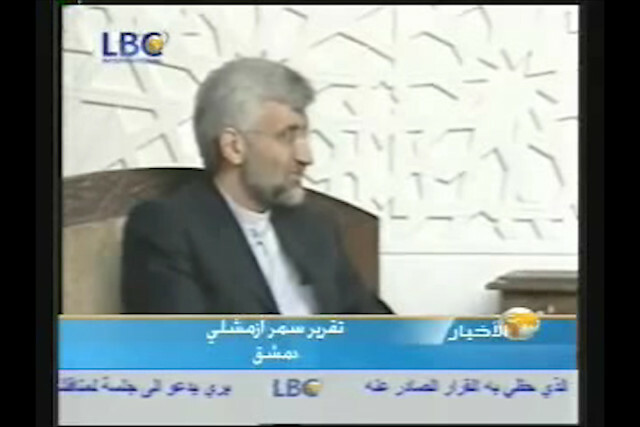 He is shown with Jalili for 15 seconds in this 8 minute SANA news video between 1:05 - 1:20. Again there is no audio, so no way to date it. For all we know, they could be from some other time like December 2009 when Saeed Jalili was in Damascus for talks with top Syrian officials, and as a matter of fact there is evidence that they may be from that visit. In any case, I think I do show that this visit today, if indeed that's when it was shot, took place in the usual place and the usual way, like at least one other visit by Jalili to Damascus, and so like the other two videos of Assad released since the explosion, could very likely be archival footage. That may be why we have yet to hear him speak. There is plenty of other evidence that Saeed Jaili arrived in Damascus today. My question is as to whether he actually met with Assad. EuroNews has a short video report on this where we actually hear from Jalili. 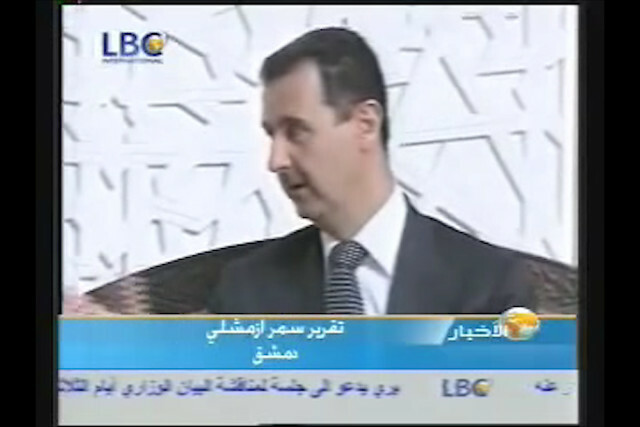 Too bad Bashar al-Assad hasn't yet spoken up and thereby silenced my speculation about his health. This is the Syrian government news video release today, it is seven minutes long and will give you a good idea of the alternate reality they feed to their people and the world. 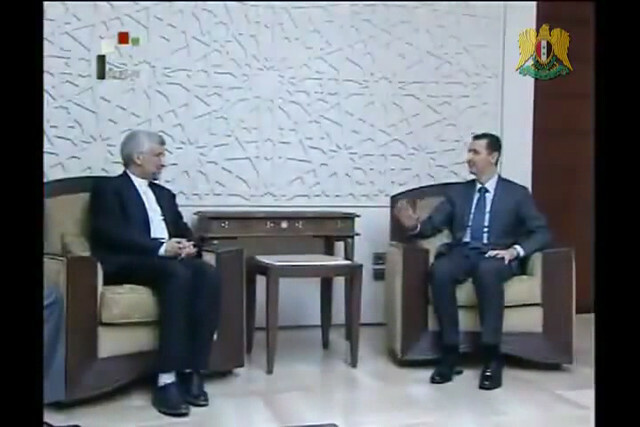 The part concerning the Assad-Jalili meeting starts about a minute into it. 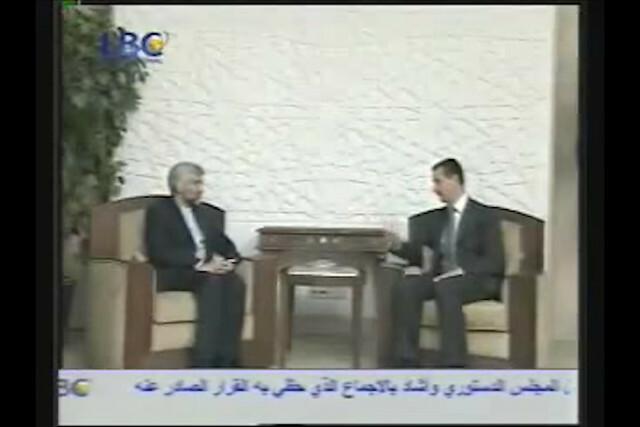 I have also found this video on YouTube of that December 3, 2009 meeting between the two. Below the fold I will show you three sets of screen shots from these two videos. Clearly they were shot with difference cameras and camera angles. The YouTube uploads are also of very different qualities. There are a few other differences, but nothing that Photoshop couldn't easy handle. The question is: Were they shot 3 years apart? So since that devastating explosion in Damascus we have seen Assad three times in video without audio and in settings where he clearly has done photo ops before. Even more suspicious are two notable absences. First he did not attend the funerals of the four ministers killed in the blast. And second, he did not make his Armed Forces Day speech on TV as usual, only published it. This is certainly strange behavior for a president during a civil war. Can you imagine the outrage if Abraham Lincoln would have cabled his address to Gettysburg while he stayed comfortably in the White House without explanation? So I still can't get past the fact that showing a clear personal leadership presence and killing any doubts about who is in control is politics 101 after surviving a decapitation attempt. That could have easily been done by Bashar al-Assad simply by releasing a video in which he speaks about current events. So why hasn't he done that? President Bashar al-Assad vowed on Tuesday to crush the 17-month rebellion against his regime and to cleanse Syria of "terrorists", as his troops engaged rebels in key battleground city Aleppo. "The Syrian people and their government are determined to purge the country of terrorists and to fight the terrorists without respite," he was quoted by state news agency SANA as telling visiting senior Iranian envoy Saeed Jalili. Assad had earlier appeared on television for the first time in more than two weeks in a meeting with Jalili, a top aide to Iranian supreme leader Ayatollah Ali Khamenei. Jalili offered Assad his country's backing, saying Tehran would "never allow the resistance axis -- of which Syria is an essential pillar -- to break. Nevermind their BS, why can AFP tell us what Jalili says but in the case of Assad they can only tell us what state news agency SANA tells us he said. How strange! One more thought before I hit the beach. 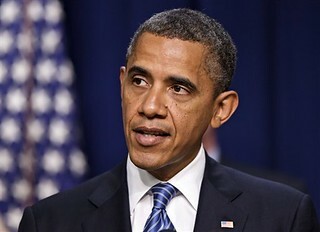 The "aging" effect of the presidency is legendary in our own country. Compare a picture of Obama in 2009 to today, and he had an easy time of it. 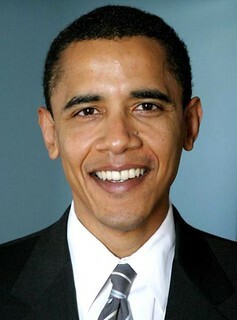 Look at pictures of Lincoln at various times to see what a civil war does to you. But here is Bashar al-Assad, 3 years later and with 20,000 of his people killed on his watch and he doesn't look as if he's aged a day. I'll bet that hiding of the untimely death of a military leader in time of war isn't all that unusual in history.